Microsoft had some cool apps/games from Windows Vista Ultimate Extras. The stage is set to make a comeback to Windows 7. You had to pay extra to get the Vista Ultimate Extras and what is awesome is that some of these games/apps are going to make it to Windows 7 for free. In fact, Microsoft Tinker just made it’s way to Windows 7 as a free download in Windows Live. To download, you need to create a Gamertag or use your existing one. I believe this is the same as the one if you had a XBox live account. 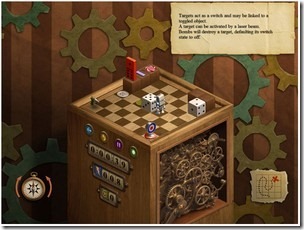 Microsoft Tinker is a puzzle game where you will help a robot reach his home by solving all the puzzles in his way. It has about 60 different puzzles to master and have hours of entertainment. You will guide your small robot through different levels of inventive mechanisms, switches, lasers, teleporters and more. Another Extras game I am looking forward to is the Texas Hold’em. In this game, you play against the computer and you can customize things like the playing cards deck and the table, etc. Here is another awesome flash game that will keep you hooked for hours together.